GM Leo Giron honored with a street named after him: Leo Giron Drive! On this auspicious occasion the 20th day of August 2013 the 102nd birthday of our founder Grand Master Leovigildo Miguel Giron. We would like to formally announce the dedication of Leo Giron Drive. The following is the official press release from Grand Master Tony Somera. Thanks to the unceasing efforts of the Little Manila Foundation, the Filipino American National Historical Society, the Inosanto Academy and Bahala Na Filipino Martial Arts, in partnership with San Joaquin County we are finally able to announce the successful naming of "Leo Giron Drive"! This newly adopted street will appropriately lead to the future Veterans Hospital in French Camp, CA. As many people now know Leo Giron was a true WWII hero and Veteran of the famous 978th Filipino Commando unit that was hand picked by General Douglas Mac Arthur to spearhead the return of the allied troops into the Philippines. 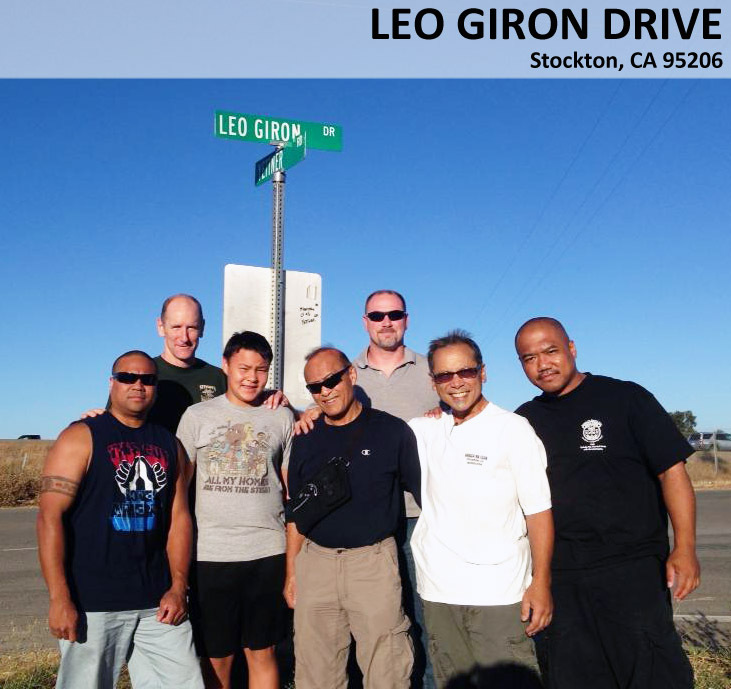 "Leo Giron Drive" is an honor to this great man, Leo Giron, who dedicated his life to the service of others, as well as Filipino Americans, Americans and most importantly it is an honor to our veterans whose sacrifices have given us all we have in our great country. We are so proud to see Leo Giron honored in this way and hope he will not be the last name adopted for a street name. But for now we applaud this event as a worthy testament to the great legacy of our forefather's gift to us. Congratulations to all the people who worked tirelessly to make this dream come true. Leo Giron Drive Dedication Ceremony held 10/26/13 at 10AM.